The butterfly bush in the water garden is blooming now. 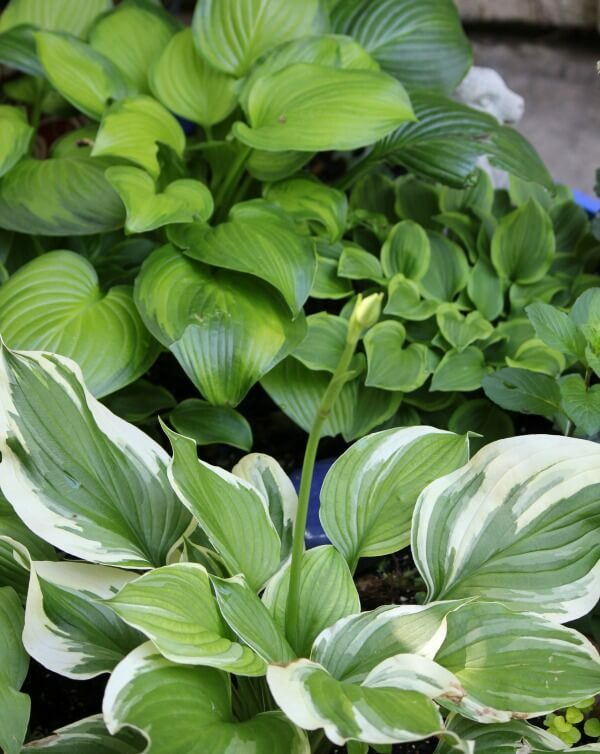 The hostas have begun to bloom as well. These morning glories are growing everywhere. Through every little crack in the cement! I love the relaxing sound of water trickling down. And the birds love the solar bird bath. All is right with my patio. beautiful garden … love the morning glories! Very pretty, Brenda. I love the water garden you have created. It is all so pretty and peaceful Brenda! How beautiful and peaceful it must be to relax out there Brenda…beautiful! Absolutely love your patio.. Beautiful.. The water is perfect. What a beautiful place to relax and listen to the sound of water trickling amongst those gorgeous plants and flowers! You create lovely spaces, Brenda! Beautiful flowers and garden area, Brenda! It's the perfect place to relax on a summer day. Brenda, this is all just wonderful! 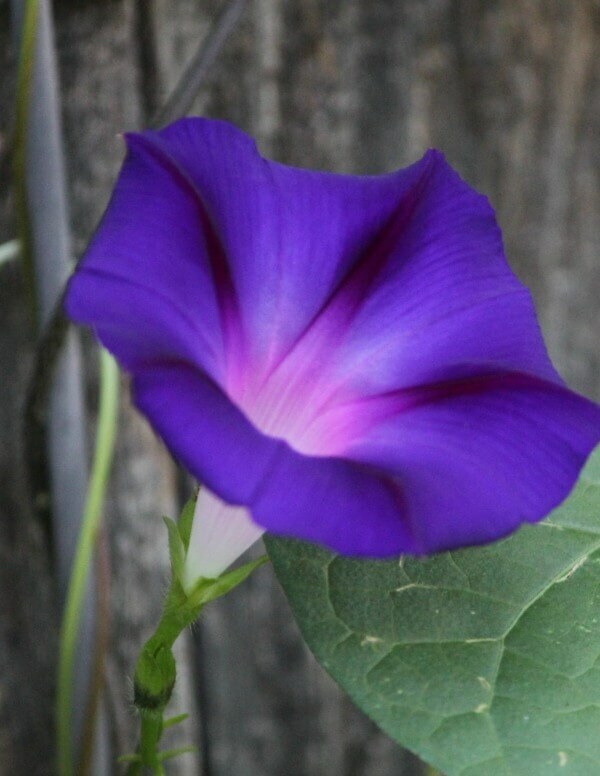 The deep color of the morning glories are truly lovely! How gorgeous! I'd love spending time on your peaceful patio! Morning glories have reseeded all over my veggie garden – should be a great show in a month or so! So lovely, Brenda…I bet you just love spending time and gardening out there! 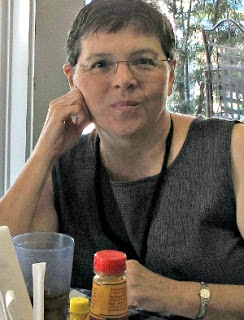 Brenda, every photograph is just beautiful! Nothing like the joy of flower gardens! Brenda, everything is beautiful and healthy-looking; congrats on your green thumb! Coincidence here…this morning in the newspaper there was an ad with photo of what they called a Texas Lilac bush. Below it said Mexican Chaste Tree. It looked just like your beautiful purple flowering bush in one of your photos this morning. Is that what your plant is called, too? 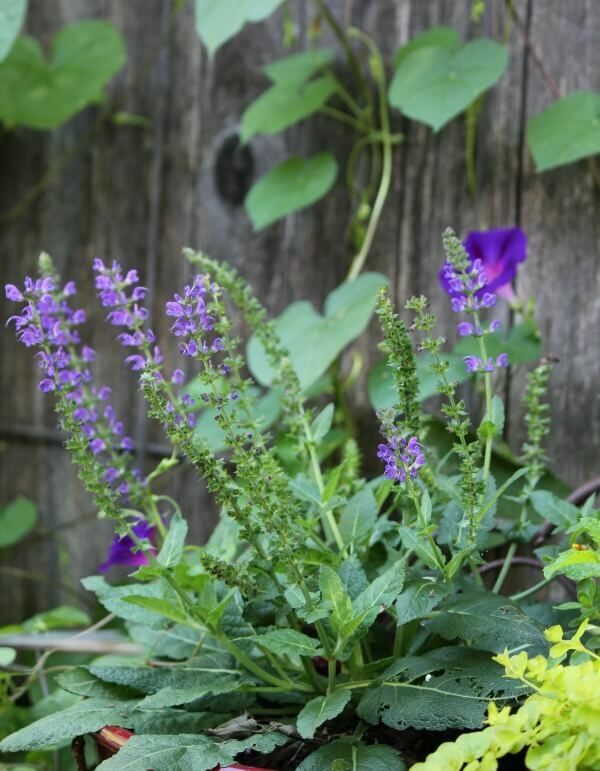 At our previous home, we had a sage bush with the identical purple flowers that had somehow gotten itself planted into a row of evergreen hedge. The flowers did not smell sweet like lilacs but had a very strong odor that I did not enjoy. Brenda, it all looks so beautiful! I love the colors of your butterfly bush! Brenda..I can not find the words to tell you how your beautiful patio oasis is..I seriously envy you..but in the best of ways! I just noticed how you lined the crack between the concrete slabs with marbles..you are so creative my friend! 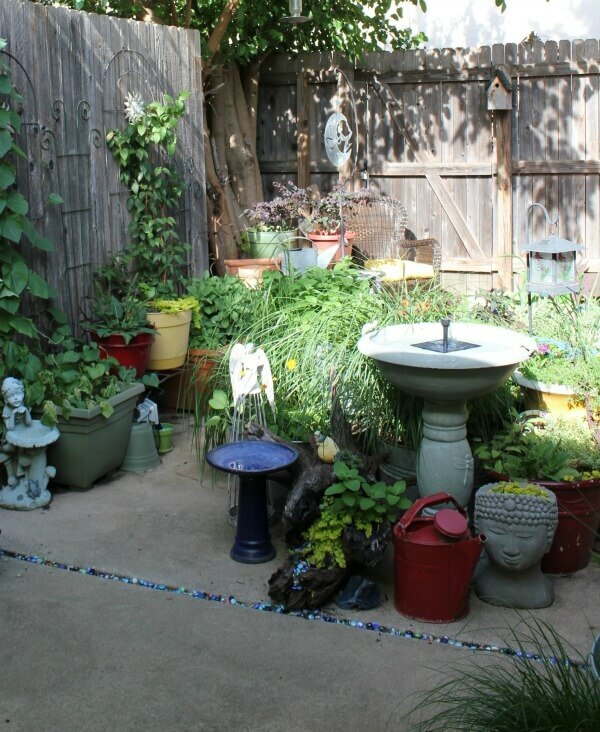 Brenda, absolutely beautiful photography…..mighty pretty patio! Beautiful outdoor sanctuary. So much gorgeous color.your garden design is so peaceful. Absolutely beautiful and it looks oh so peaceful….. I love how you made your patio into such a lush garden area! Beautiful and peaceful. I believe your "butterfly bush" is a Milkweed plant. Melanie…I was also inking, it didn't look like a butterfly bush to me. The butterfly bushes I've seen usually have purple blue flowers….but then again maybe I was looking at a different plant. 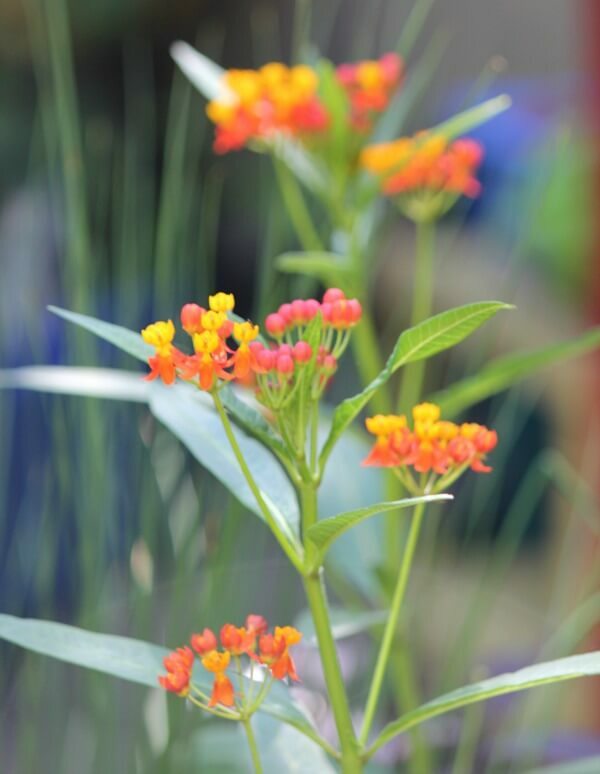 We call it butterfly weed as well as milk weed here in the Ozarks. I think the scientific name of what we call butterfly bush is Buddleia. It's a much bigger plant, some get as big as lilacs. I have heard folks call them summer lilacs, though they really don't look like them at all to me, other than having a long-ish flower. Your retreat, your haven, your glorious garden filled with beauty, nature and joy! So great to have you share this with us at Thoughts Of Home On Thursday too. Brenda- you have created an outdoor haven where everything is thriving. 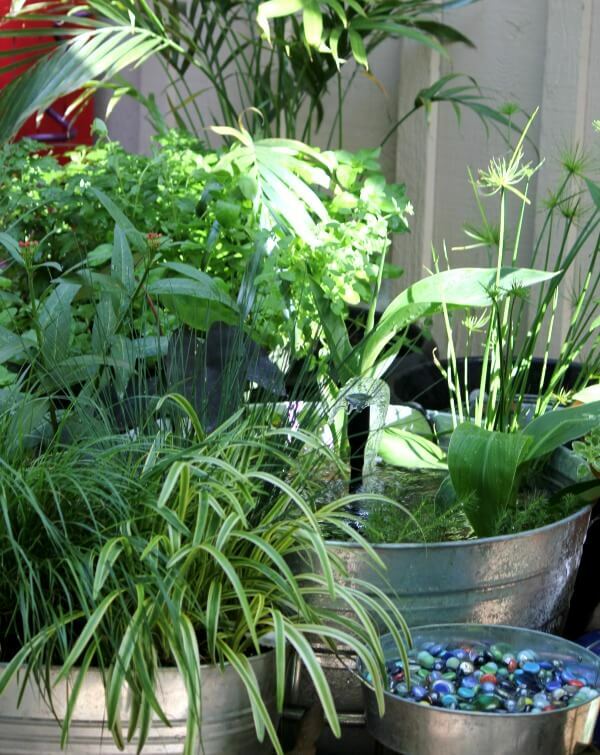 Love your garden space with lovely blooms and foliage and your solar fountain. It all looks very peaceful.